You know what? Writing this post isn’t easy. All I’ve got are words and pictures, and neither could ever do justice to the user experience offered by the new QNX technology concept car. They cannot, for example, recreate the rich, luminous sound of the car’s full-band and wide-band hands-free calls. 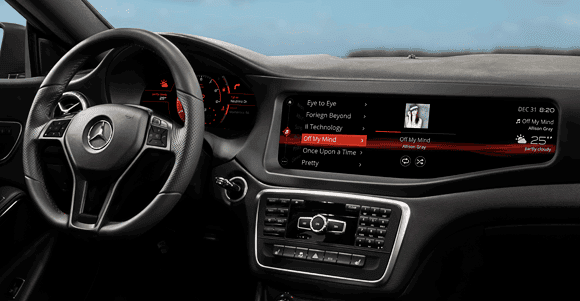 Nor can they evoke how the car blends speech recognition with a touch interface and physical controls to make navigation, Internet radio, and other applications wonderfully easy to use. But on second thought, words and pictures aren’t that bad. Especially when the car — and the in-dash systems that the QNX concept team created for it — are so downright gorgeous. So what are we sitting around for? Time for a tour! Actually... hold that thought. I just want to mention that, if you visit our Flickr page, you can find full-resolution versions of most of the images I've posted here. Because why settle for low res? Okay, back to the tour. I've got two things to say here. 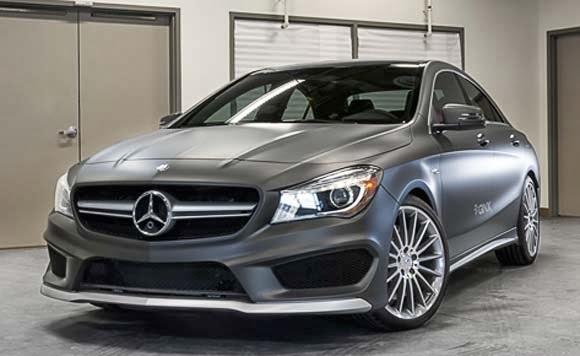 First, the car is based on a Mercedes-Benz CLA45 AMG. If you guessed the model correctly based on the teaser images we published on the QNX website, I bow in homage to your eagle eye. Second, while we snapped this photo in the QNX garage, don’t think for a minute that the garage is ever this neat and tidy. On any given day, it’s chock full of drill presses, tool boxes, work tables, embedded boards, and QNX engineers joyously modding the world’s coolest cars — exactly the kind of place you expect it to be. And want it to be! But to humor the photographer, we (temporarily) made this corner clutter-free. We're nice that way. Let's get behind the wheel, where you can see the car's custom-built digital instrument cluster and infotainment system. The bold design, the clean layout, the super-easy-to-access controls — they all add up to systems you want to interact with. Just as important, the look-and-feel of the instrument cluster and infotainment system are totally different from the corresponding systems in our previous concept car — an excellent illustration of how the QNX platform can help customers create their own branded experiences. Time to zoom in on the digital instrument cluster, which helps simplify driving tasks and minimize distraction with an impressive array of features. Turn-by-turn directions pulled from the navigation system? Check. Video feed from front and rear-view cameras? Check. Notifications of incoming phone calls? Check. 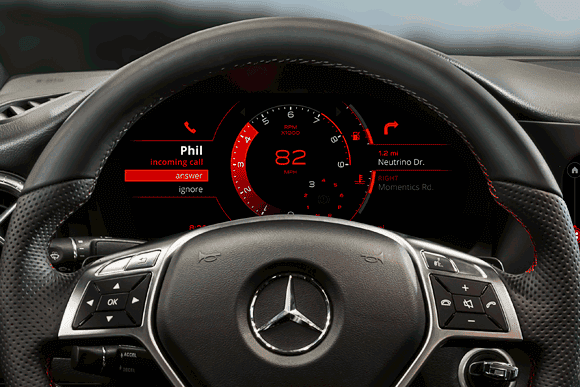 Alerts of incoming text messages, which you can listen to at the touch of a steering-wheel button? Check. If that’s not enough, a demo system in the QNX booth at CES also demonstrates a navigation system from Aisin AW — more on that in an upcoming post. As I alluded earlier, what you can't see in the new concept car is just as important as what you can see. For instance, if you look at this image, you'll see the infotainment system's media player. But what you can't see is new acoustics technology from QNX that lets you "barge in" and issue voice commands even when a song is playing. How cool is that? Hold on, what's this? It looks like a smartphone app with an interface similar to that of the virtual mechanic, above. In fact, it's a lot more than that, and it touches on some cool (and very new) technology that can help cars become fully managed citizens of the cloud. More on that in an upcoming post. That's it for now. For more details on what QNX is showcasing this week at CES, check out the press releases posted on the QNX website. And stay tuned to this channel for further updates from 2014 CES — including a profile of our very new QNX technology concept car for acoustics. Looks really nice. When can we start to see these things in cars? Within the next year or longer? Ivan, QNX technology is already shipping in 10s of millions of cars, including models from Mercedes. Note, however, that this specially modified CLA is a technology concept car. 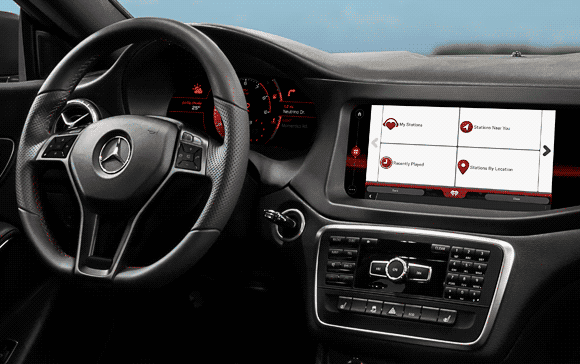 It is meant to demonstrate how QNX technologies can enable connected cars of tomorrow. It is one-of-a-kind and won't be launched as commercial product. My son would like to do a Co-op with you guys. Awesome work!